The Grayfox team re-designed the entire area to incorporate a longer pool that extends into a glass extension. Refurbishments in both residential and commercial pool sectors continue to provide steady revenue for many of the UK’s core pool and spa businesses. Whether it’s cosmetic upgrades, improving energy efficiency or to meet current industry standards, repair and refurbishment has always provided a major lifeline for many pool and spa companies. 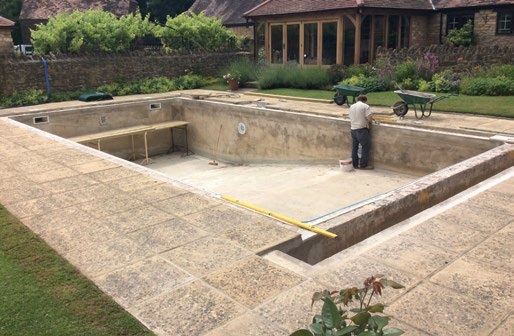 “Refurbishment is very much a process revolving around trust and professionalism,” comments Steve Jones of Grayfox Swimming Pools. “Such projects are always about the client trusting that the designer has understood the brief, the designer delivering the brief and then trusting the professionals to deliver the brief on-site in a manner that reflects the client’s initial vision.” Larger scale pool refurbishment and renovation contracts tend to be for clients who have bought a new home and inherited an outdated pool. These clients want to modernise the pool and add new features such as jets and counter current units. Other clients simply want to put their own stamp on the pool by re-vamping the design to reflect their own taste. 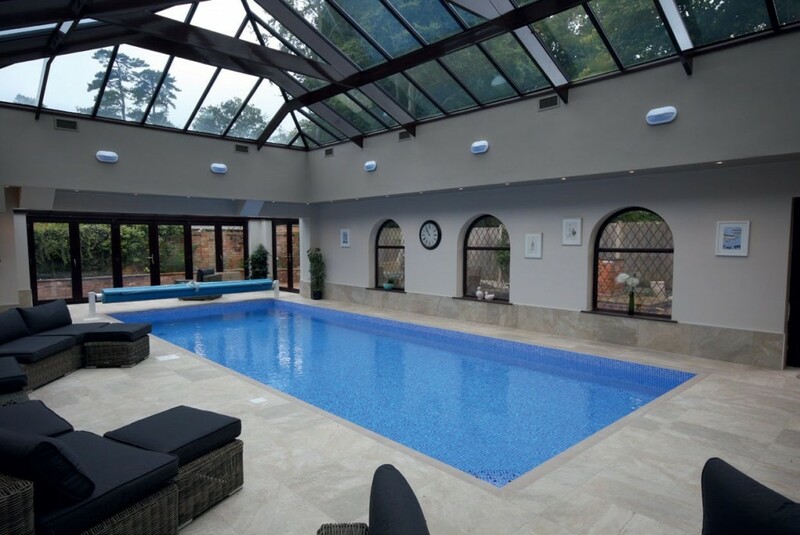 In one such case, Lincolnshire-based Grayfox Swimming Pools were approached to upgrade a home swimming pool and to transform the pool hall into a contemporary and inviting space. The team re-designed the entire area to incorporate a longer pool that extends into a glass extension. They also removed the old roof and replaced it with a high efficiency glazed portal structure to enhance the size and make the overall space more aesthetically pleasing. A highly efficient Heatstar XF EC AHU and fully ducted ventilation system was also installed. “We had to deal with the solar gain from the glass roof to ensure that the pool hall did not overheat,” explains Steve. He continues: “The glass roof is what really transformed the space, taking it from dark and cold looking, to warm and light. One of the most common challenges to be overcome with renovation projects is getting to know the structure of the pool that was built by another company. Part of the renovation process is correcting suspect building methods and designs from the original build and there can often be unforeseen hidden items that can cause unexpected problems. “Refurbishments are a major part of our business,” reveals Tim Bareham of Dorset-based pool specialists Cresta Leisure. Tim says that worryingly many school, hotel and holiday park pools are still operating with residential filter packages, have inadequate circulation or have pipes that are too small for the requirements of the pool. In terms of design, Cresta Leisure has seen a trend towards converting old commercial concrete and tiled pools to liner pools with a tiled finish at the water level. by another company. Pic: Cresta Leisure. Following a referral from a previous client, Cresta Leisure was commissioned to refurbish an outdoor pool at a residential property. With no specific brief to work to, the team put together a proposal for the project, which was then agreed by the client. Located in a walled garden, access to the pool was a challenge for the team and meant that everything had to be brought to and taken from the garden in a wheelbarrow via the neighbouring paddock. Due to the ground water issues that were expected and the requirement to line the existing fibreglass steps, the on-site lining method was specified. For ease of use and cleanliness, the sheet cover was the preferred option.